Since it’s almost the end of the second month of the self-made wardrobe project, I figured I should probably get around to posting the first month’s wrap up. August was the month of figuring out systems and routines for this project. Creating a wardrobe building “plan.” Figuring out how to seamlessly take a photo every day, and then turn those photos into a post every week. A new laundry routine. A different kind of sewing & knitting practice. Finding routines, making plans, figuring out systems, and streamlining thing – that’s what August was about. How often did I wear what? The Black Tank Top – my default. The Floral Maxi Skirt – sort of took the place of jeans throughout August, easy to throw on and comfortable. The Handkerchief Hem Circle Skirt & the Red and White Striped Pirate Skirt – I love both of these too, but they weren’t quite as easy to throw on as the floral maxi skirt. Black maxi skirt with slit – adore. But the length really only works with flats. Jersey Wrap Dress – I wore this on an overnight trip, I wanted something that was super comfy for the train ride, and that I wouldn’t mind wearing two days in a row. Blue Kimono – this was one of the first pieces I made for this project, but I didn’t need it much in August. Black Racer Back Mini Dress – I can’t believe I wore this with tights & the kimono on Day 3 – it was a cool/chilly day, but it was still August. I haven’t worn it more, because it’s a pinch to tight, so I want to add tuxedo stripes, and a touch more ease. Alice in Wonderland Skirt – as much as I love this skirt, I have to be in the right mood to wear it. Gingham Skirt – I finished this late in the month, it’s not my favorite piece ever, but I like it. 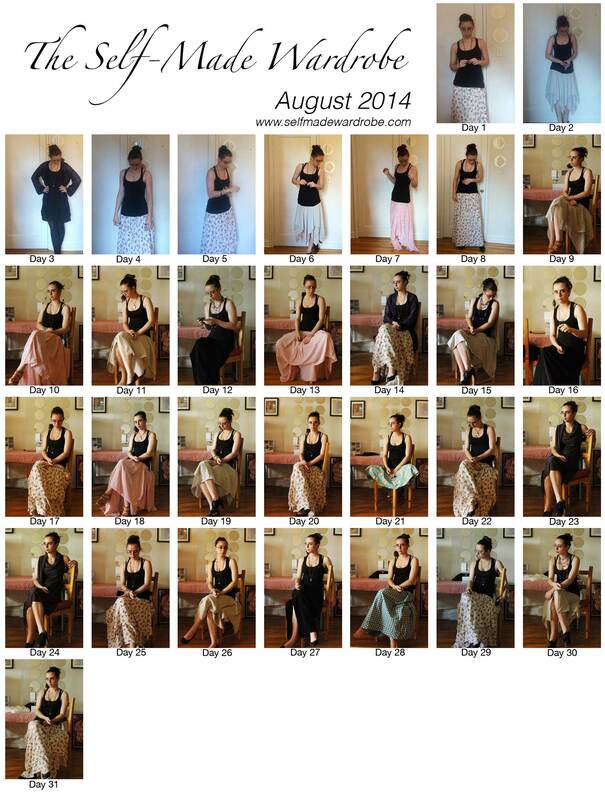 : Week 1 – the first 8 days of the self-made wardrobe project. : Week 2 – getting a handle on everything. : Week 3 – starting to look towards fall. : Week 4 – the end of month 1.
: The basic plan is balance – well, unbalanced balance. : The Versio Sweater – beginnings. : What’s the difference between knitted & woven fabric? The Self-Made Wardrobe is a project where I only wear garments I’ve made, for one year. You can read more about the project here. Or follow along by signing to receive blog updates in your inbox.